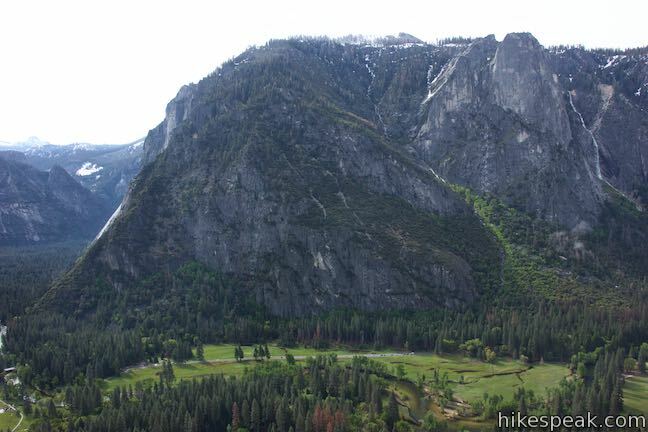 Yosemite Valley looks great from the bottom up, the top down, and even the middle out. 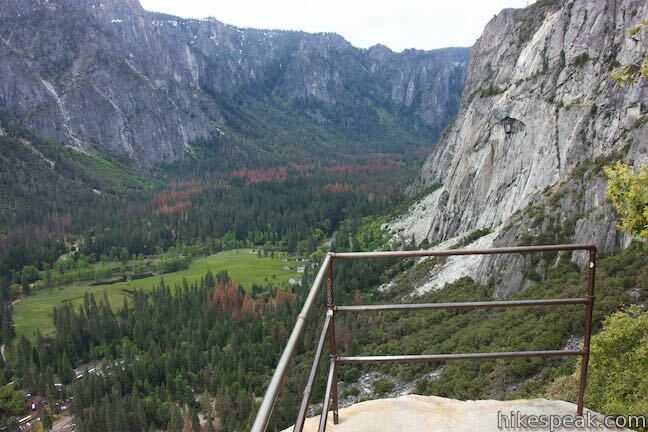 For this neither-up-nor-down view over Yosemite Valley, visit Columbia Rock, a viewpoint on Yosemite Falls Trail perched about thousand feet up the north wall of Yosemite Valley. 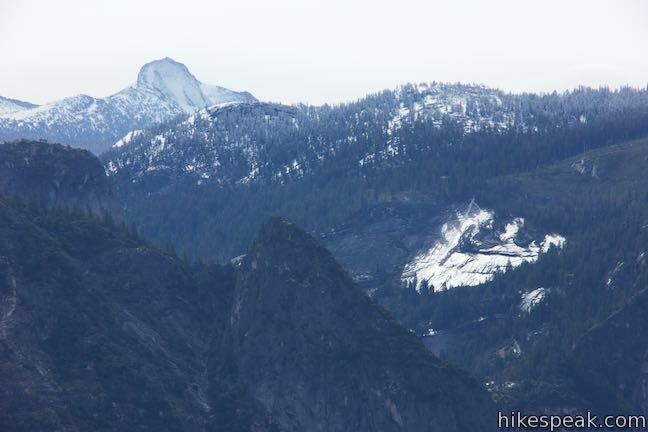 The hike from Camp 4 up to Columbia Rock is 2.2 miles round trip with 985 feet of elevation change. 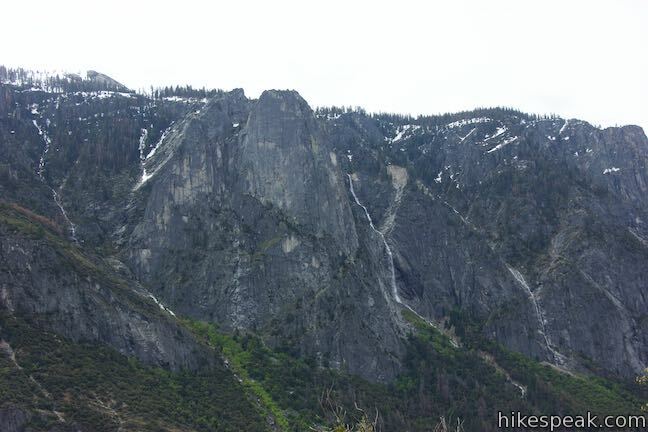 Of course, continuing up Yosemite Falls Trail leads to incredible views of Upper Yosemite Falls, so turning around a Columbia Rock is definitely optional. 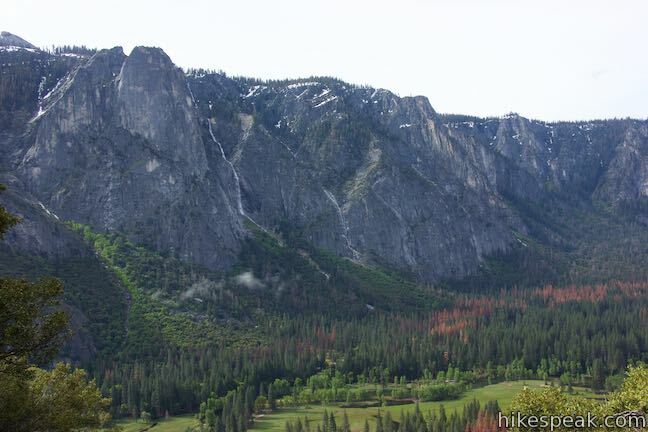 Find Yosemite Falls Trail starting from Camp 4, a walk-in campground near Yosemite Valley Lodge. 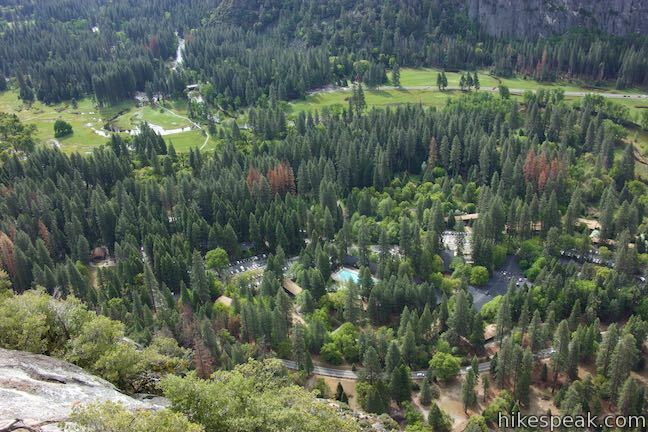 Those not staying at the campground can reach the trailhead by taking the Yosemite Valley Shuttle to the stop for Camp 4. 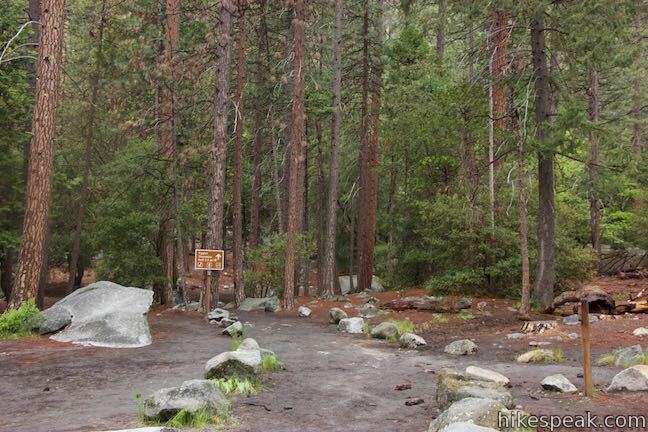 Walk to the trailhead at the north end of the campground parking area. 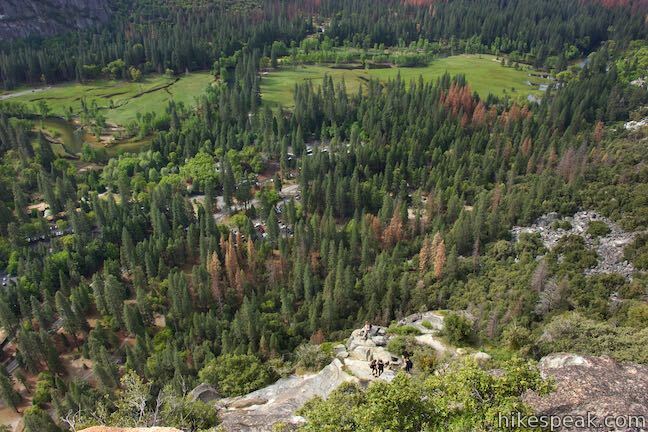 Yosemite Falls Trail enters the woods and comes to an intersection with Valley Loop Trail, which meanders around the edges of Yosemite Valley. 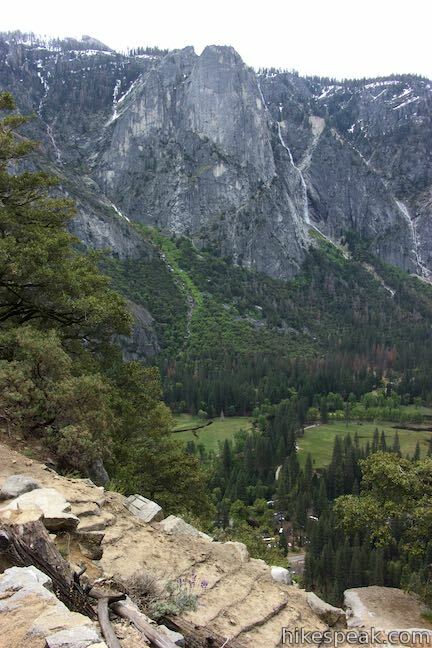 Lower Yosemite Fall Trail is to the right. 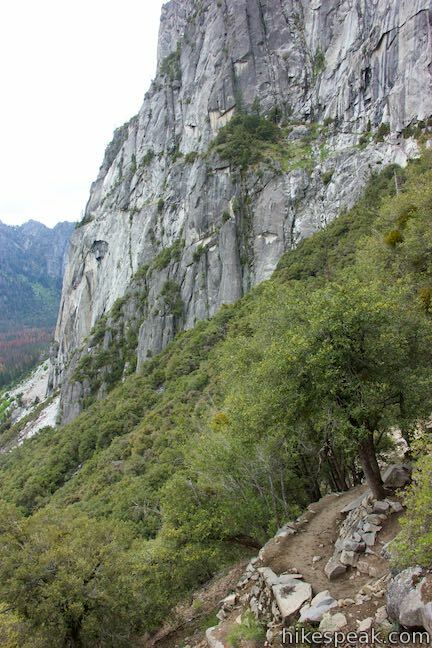 Make a left and an immediate right to proceed up Yosemite Falls Trail. Past the junction, the trail curves past a trail mileage sign. 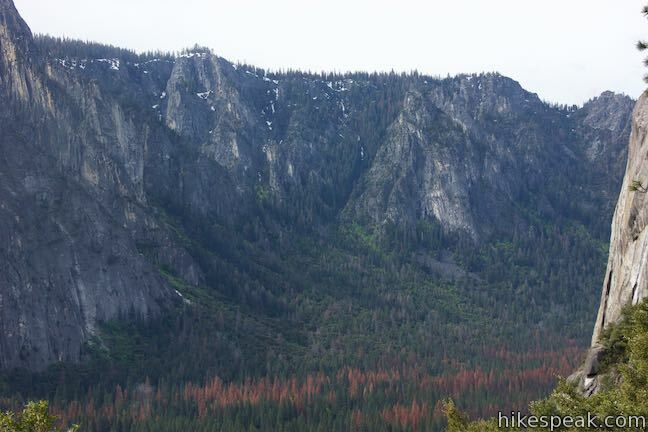 While it doesn’t list Columbia Rock, rest assured that you are on the right track. 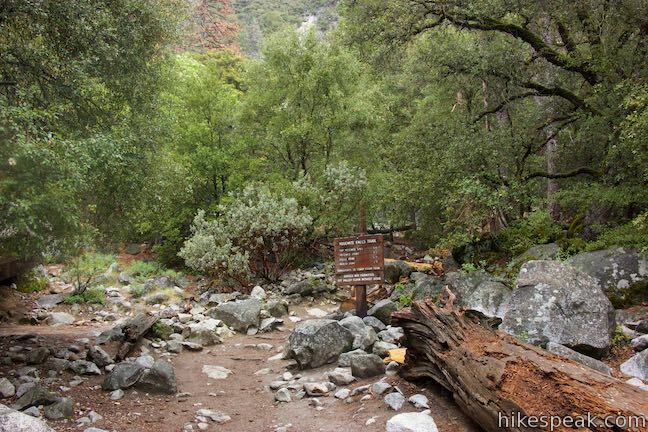 Ease around a large boulder (one of many that fell from the steep wall above) and pass a sign for the Yosemite Wilderness boundary. 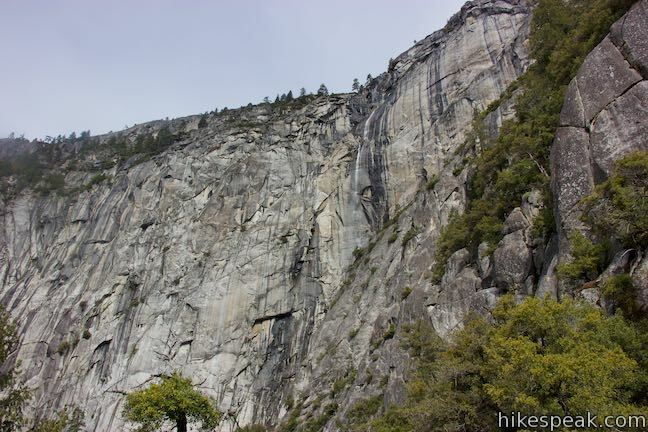 Yosemite Falls Trail launches up the side of Yosemite Valley, attacking a dense string of switchbacks that lead to Columbia Rock. 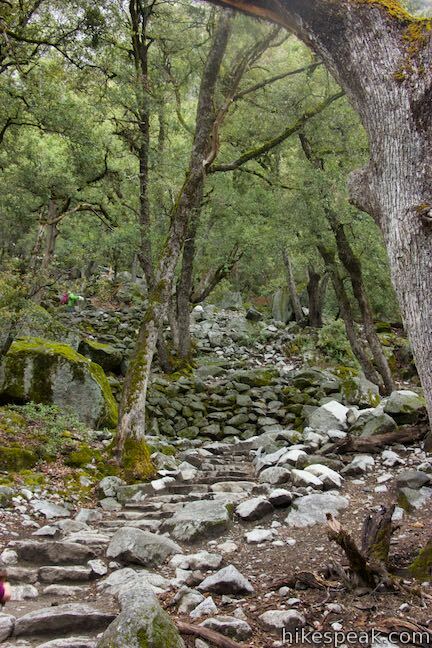 Ascend a talus slope shaded by a forest of live oaks that grow among the boulders. 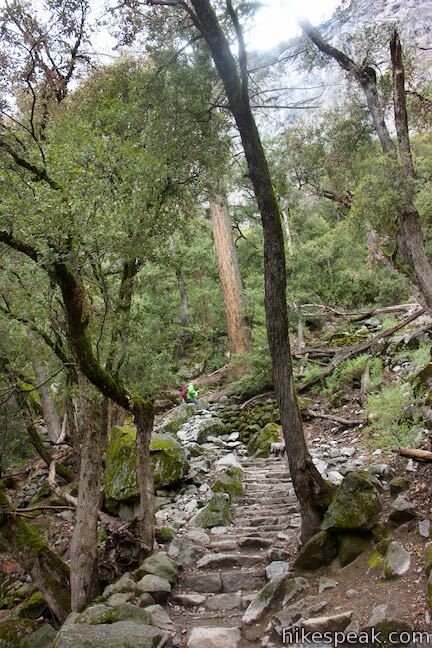 Admire the craftsmanship of the stone steps as you twist and turn up five dozen switchbacks. 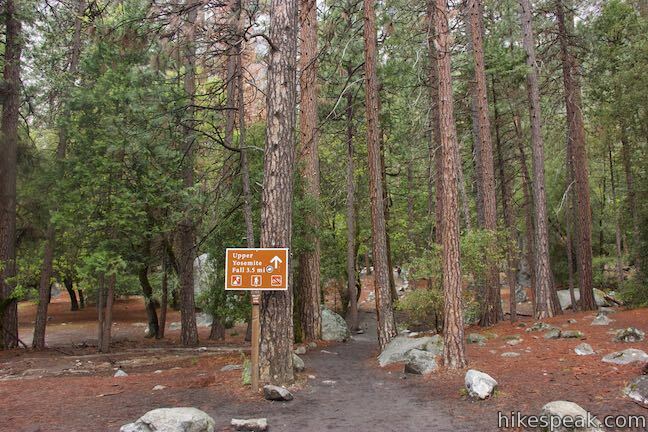 A sign at the bottom of the trail explains that John Conway laid out this route in the 1870s. 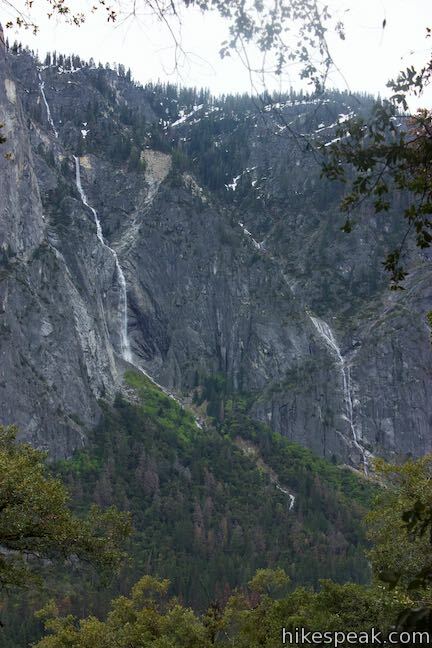 John Muir called John Conway the master trail-builder of Yosemite Valley in his book, The Yosemite. 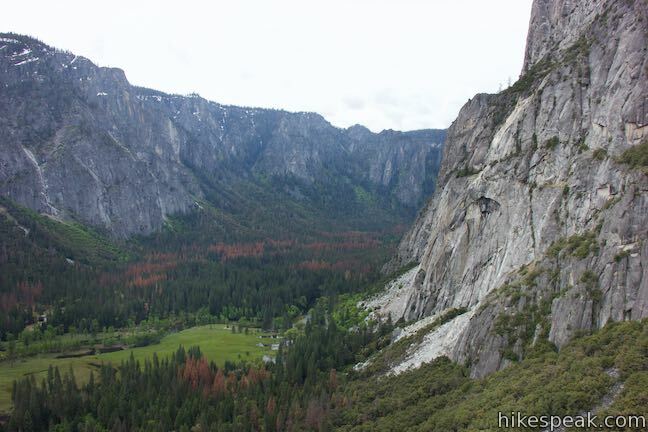 Although the trail has certainly been improved in the last 150 years, the number of switchbacks may not have changed. 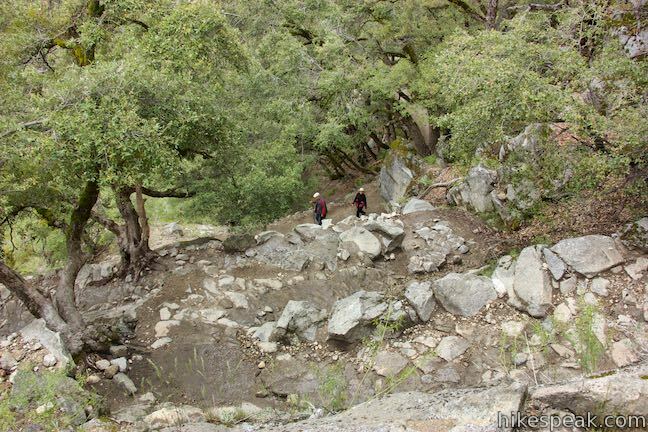 March up the steep steps, rising even higher up the side of the valley. 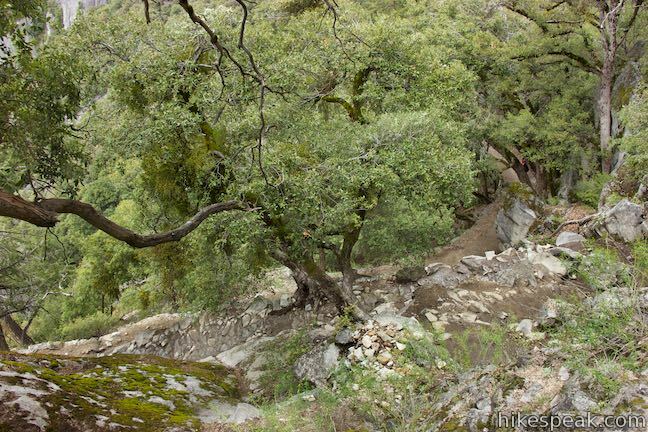 Ponderosa pines, incense cedars, and bays laurels add variety to the oak-dominated forest. 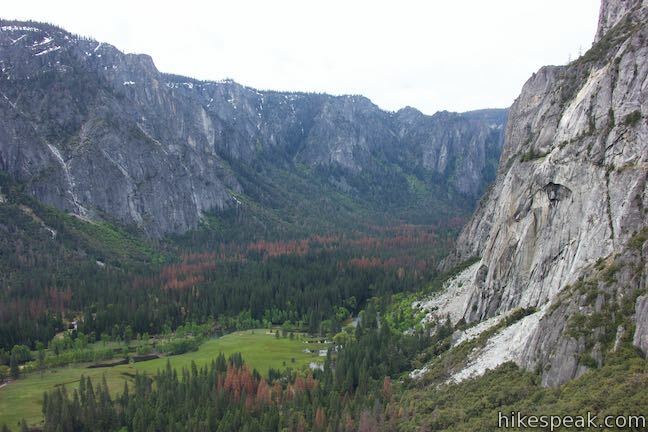 As the train gains in altitude, it finally reaches some broader views. 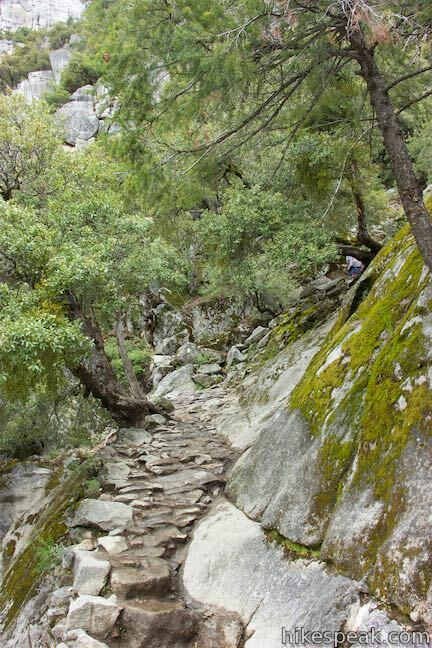 Cross a rocky area, 0.6 miles from Camp 4 where a seasonal stream flows over the trail during the spring snowmelt. 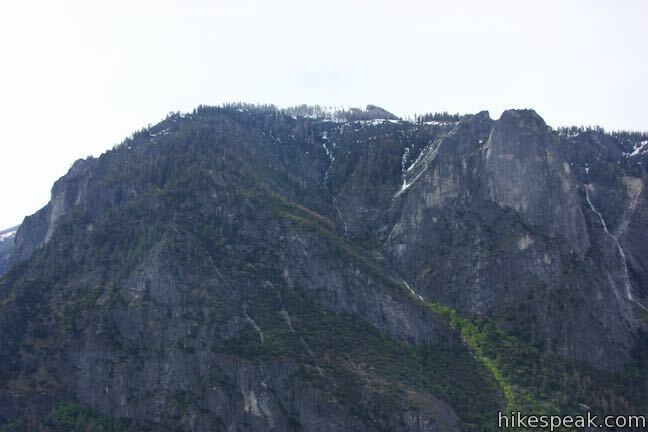 Looking up, you may see an ephemeral waterfall sliding down the cliffs above, draining a small basin on the east side of Eagle Peak. 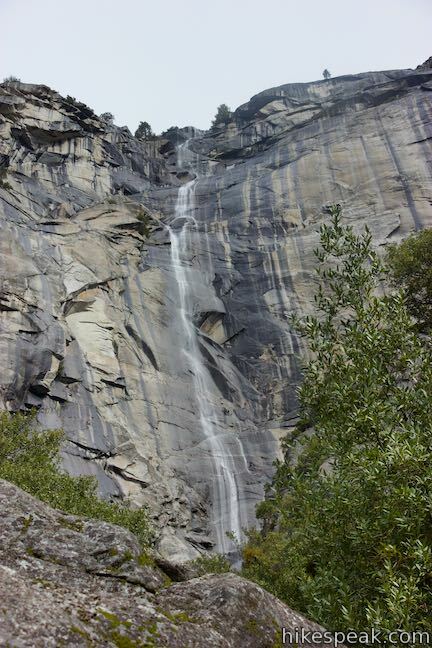 This fleeting waterfall does not seem to have an official name (Conway Falls or Columbia Falls could be appropriate titles if none exists). 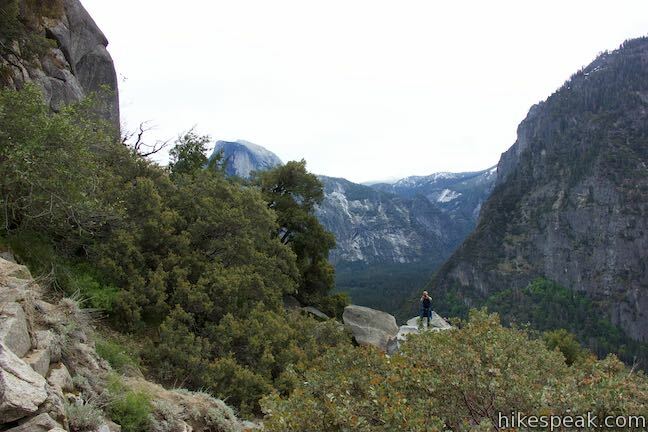 The creek crossing the trail creates a gap in the forest, allowing you to look out across Yosemite Valley toward the rugged granite on the south wall. 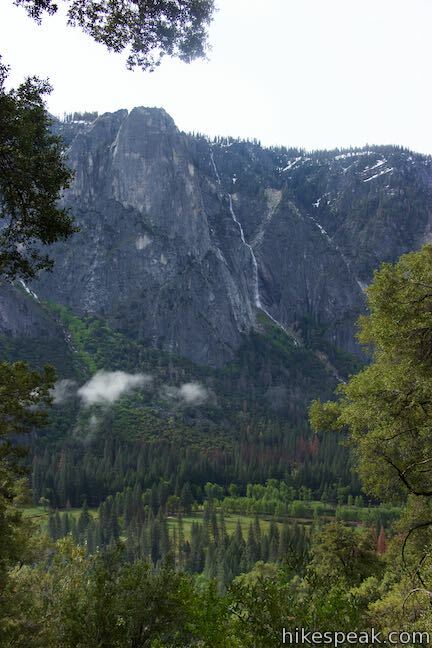 During spring months when the snow is melting along Glacier Point Road, you can watch Sentinel Falls drop like a white staircase on the opposite side of the valley, sliding 2,000 feet from the rim to the valley floor. 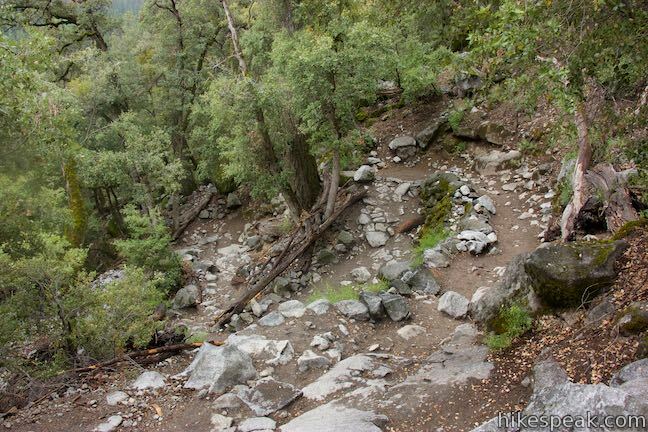 As a break from the dizzying switchbacks, the trail gets straighter for a stretch. 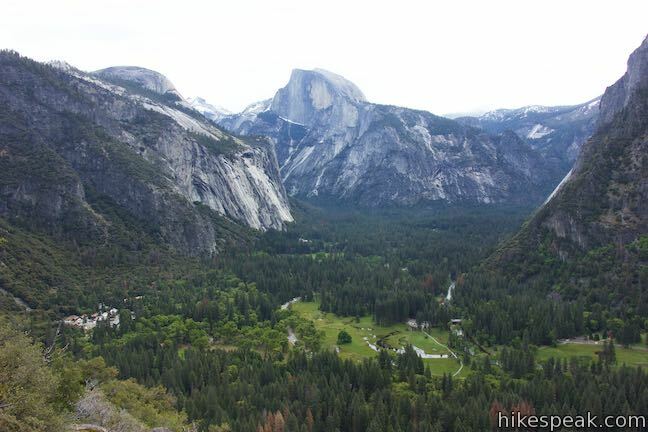 After another tenth of a mile, an even bigger window opens through the trees looking out over Yosemite Valley. 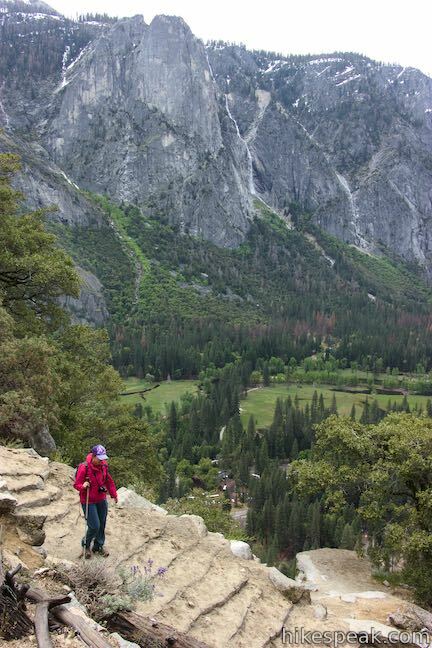 Columbia Rock offers the best perspective yet, so proceed up another cluster of switchbacks. 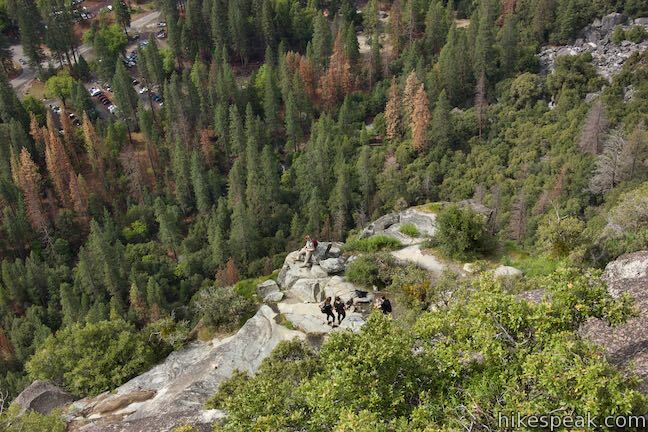 After a mile of hiking, you may spot some people on a rocky bench below the trail. 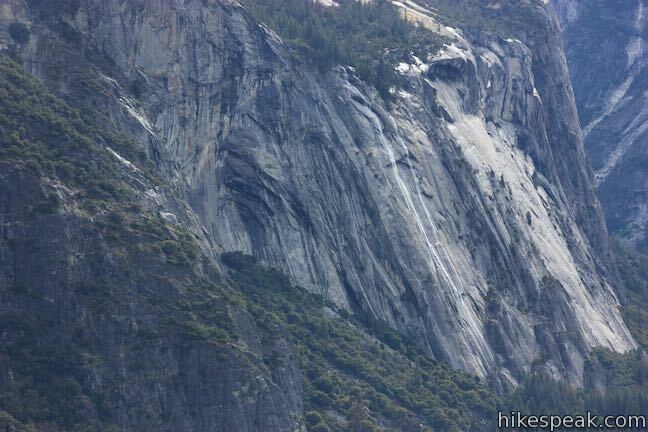 This is not Columbia Rock, but seems to serve as an alternative – by choice or confusion. 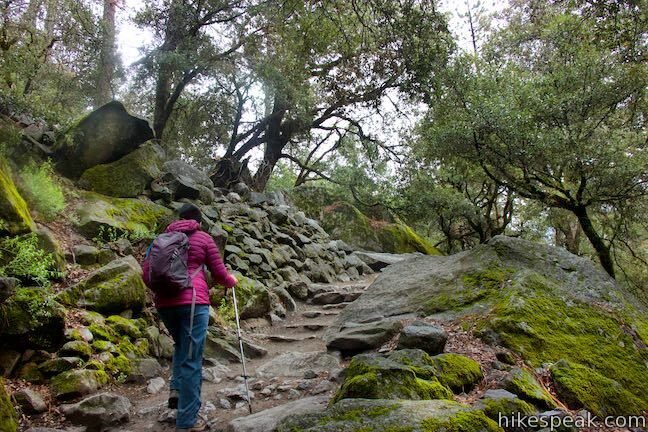 Just continue up the trail through a few more twists and turns to find an obvious spur on the right to Columbia Rock. 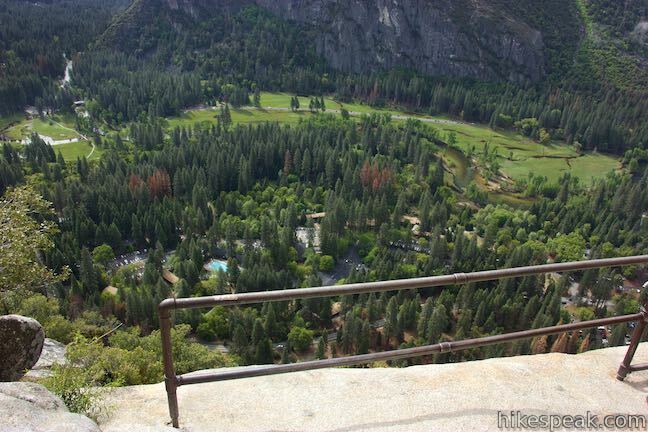 Step up to the metal railing at Columbia Rock and have a look out over a full sweep of Yosemite Valley. 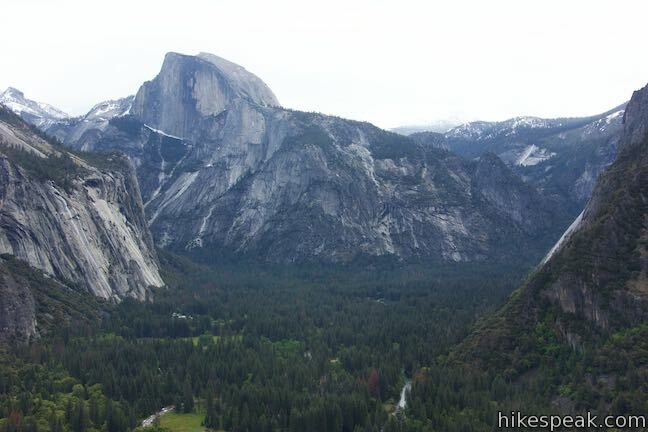 Initially, your eyes will be drawn east toward mighty Half Dome. The sheer face is dramatically exposed from this perspective. 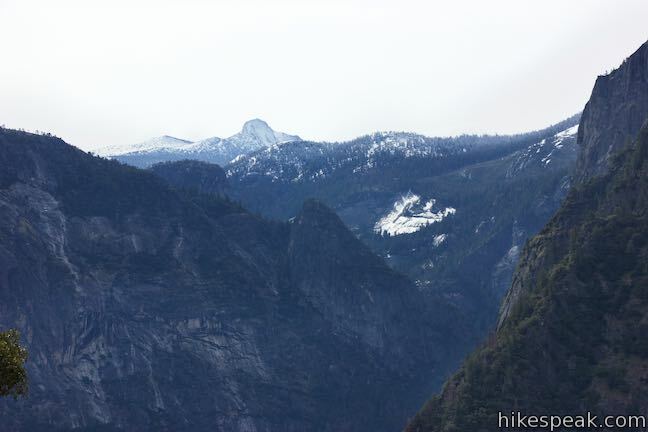 To the south of Half Dome, Mount Clark rises to a point among the more distant mountains. 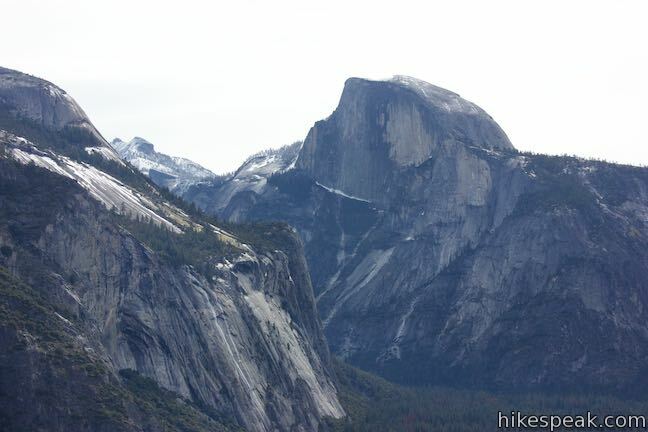 Across the valley to the south, the towering south wall rises to Sentinel Dome near Glacier Point. 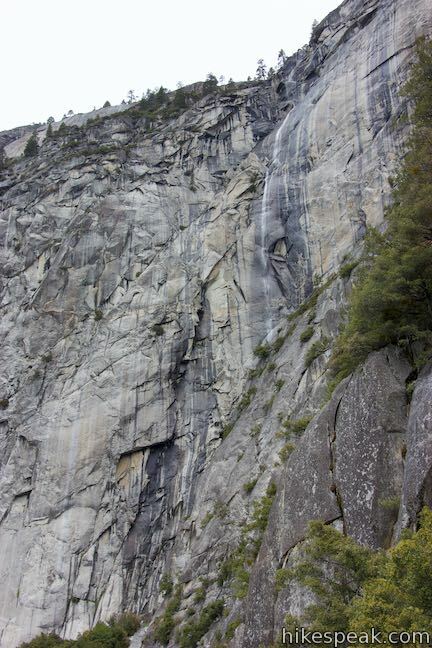 Sentinel Falls tumbles down one of the creases in the wall to the southwest. Farther to the west, the south wall gets more jagged at the Cathedral Rocks. 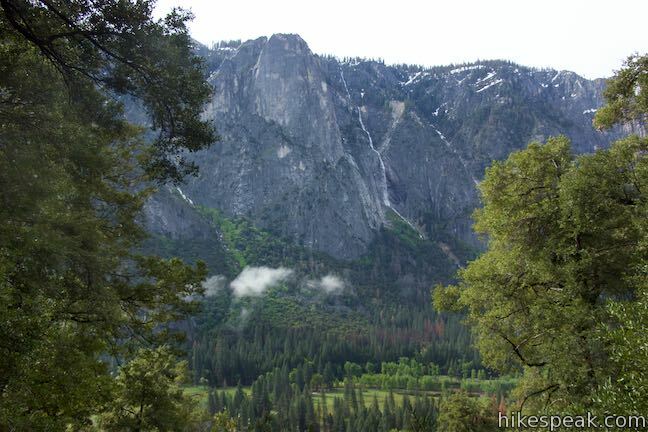 To your right, the El Capitan-like face of Eagle Peak rises from the north side of the valley, blocking views of the real El Capitan. 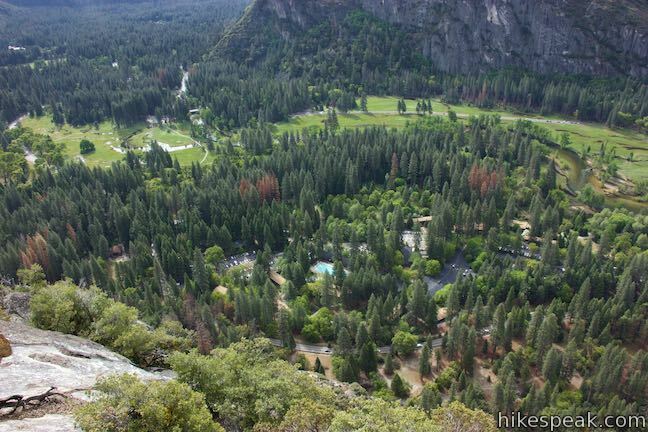 Yosemite Village is spread out below Columbia Rock, and a green forest-wrapped meadow stretches to the west end of Yosemite Valley. 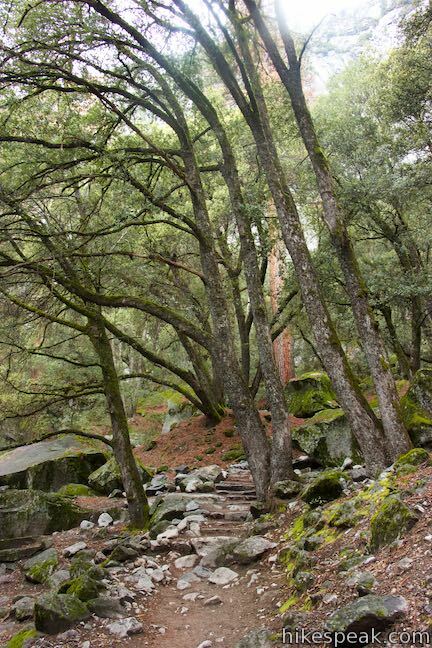 The Merced River snakes through it all. 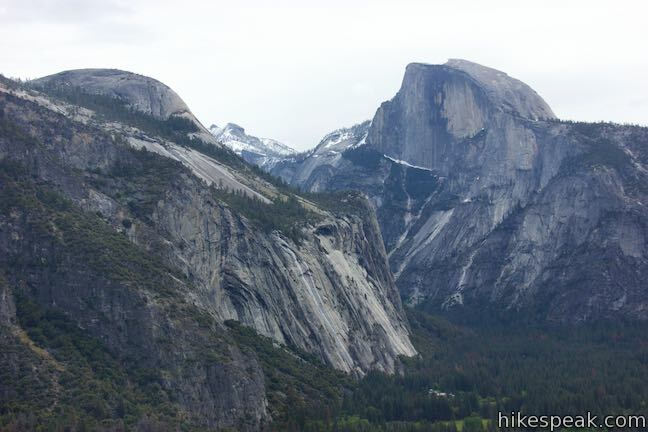 Things sure look small down there, which make sense since you climbed nearly a thousand feet to get to Columbia Rock. 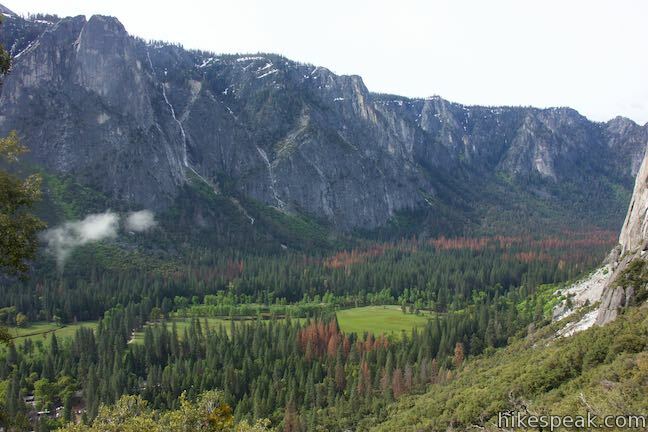 You are standing at around 4,975 feet of elevation and Yosemite Valley is at 4,000 feet. 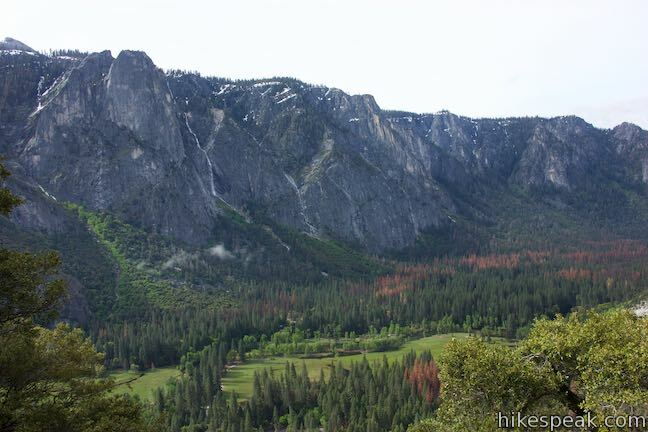 Yosemite Falls isn’t visible from Columbia Rock, but the 180-degree view from the side of Yosemite Valley makes this perch a definite highlight along Yosemite Falls Trail. 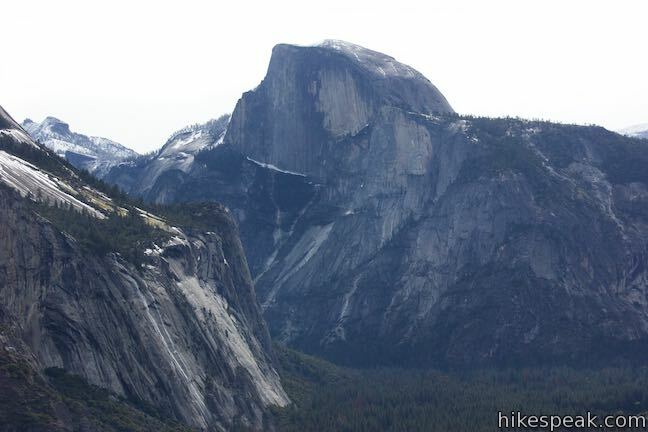 The Columbia Rock perspective of Half Dome towering over Yosemite Valley is so fulfilling that many visitors turn around at Columbia Rock. 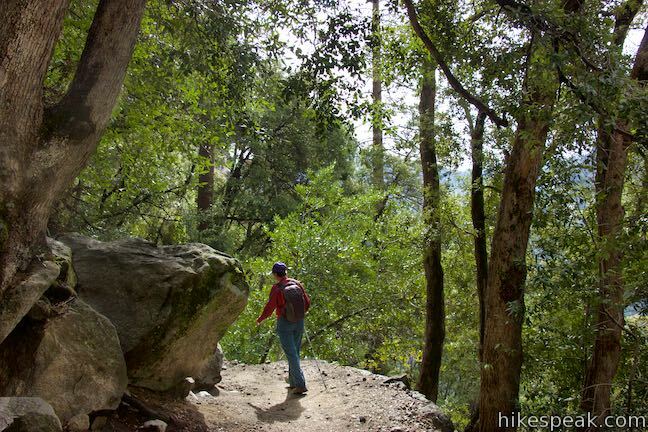 The hike to Columbia Rock is 2.2-mile round trip hikes with 985 feet of elevation change. 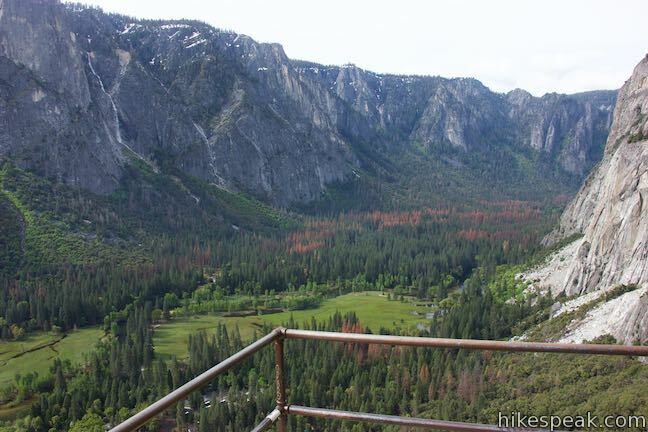 Yosemite Falls Trail continues for 2.4 miles from Columbia Rock to the top of Upper Yosemite Falls. 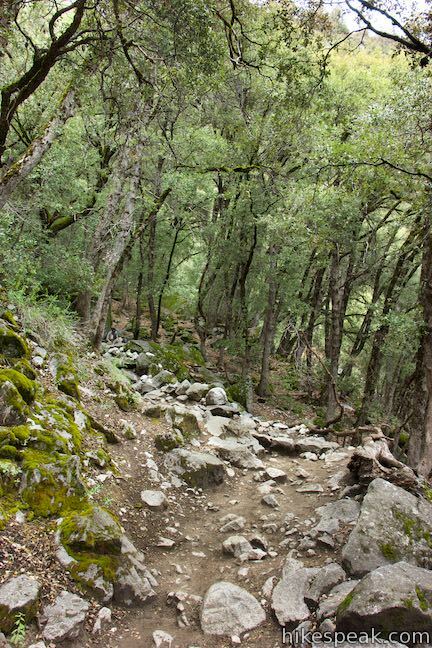 The full trail has 2,715 feet of elevation change, so a major climb remains to reach the top. 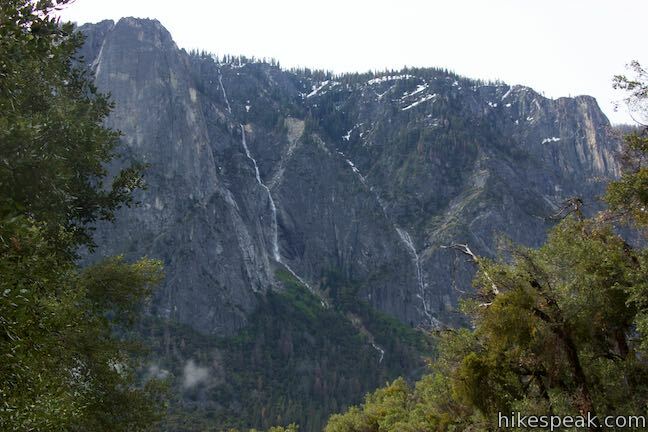 If you appreciate waterfalls, consider continuing at least another 2/3 of a mile up the tapering trail to the foot of Upper Yosemite Fall (you’ve already completed most of that climb). 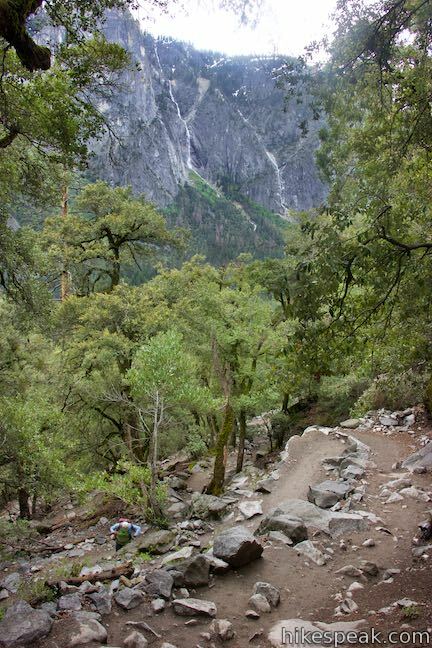 Dogs and bikes are not allowed on Yosemite Falls Trail (also known as Upper Yosemite Fall Trail). 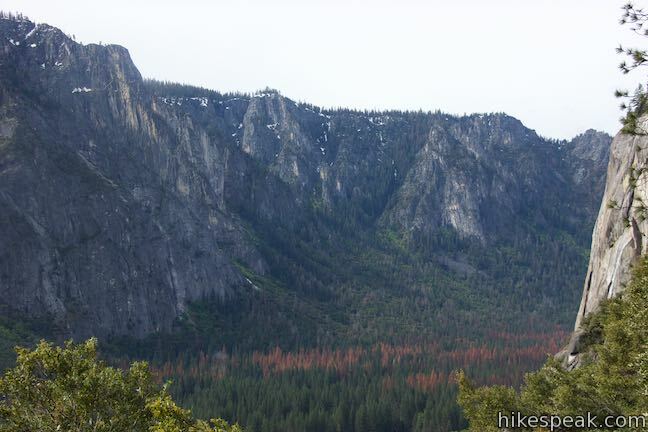 This hike goes through Yosemite Wilderness, so a wilderness permits would be required if you hiked farther and stayed overnight. 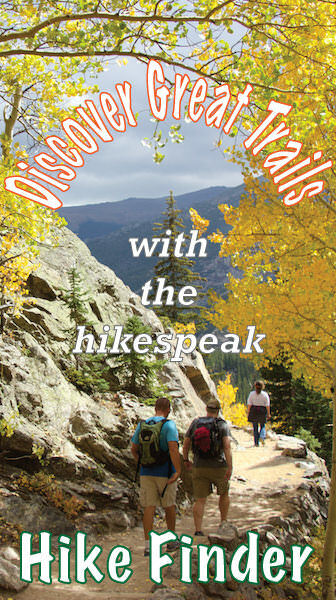 Day hikers do not need to acquire or carry permits. 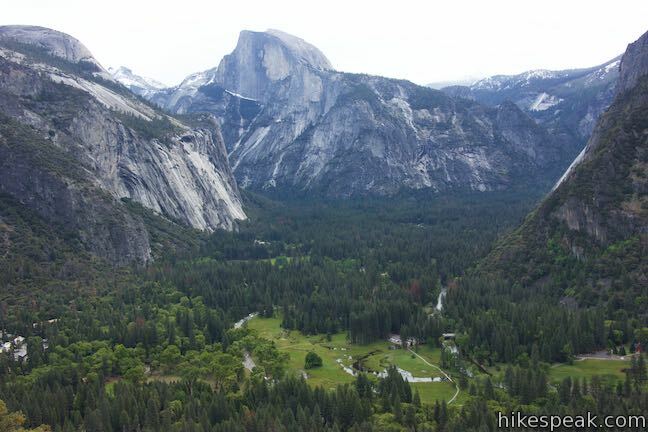 Yosemite National Park has an entrance fee. 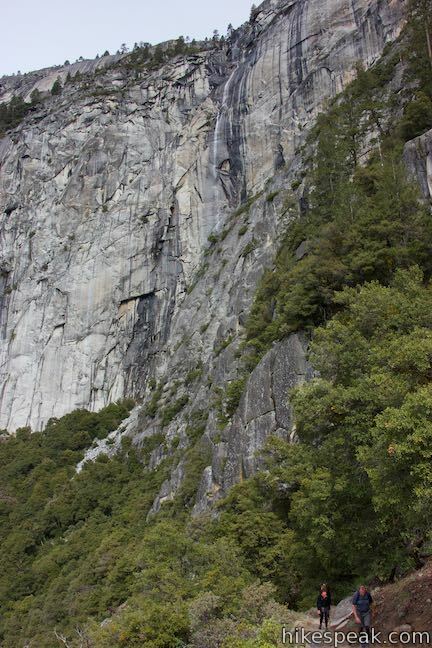 To get to the trailhead: Make your way into Yosemite Valley, parking where available near Yosemite Village or Curry Village. Take the free park shuttle to Stop 7 for Camp 4. 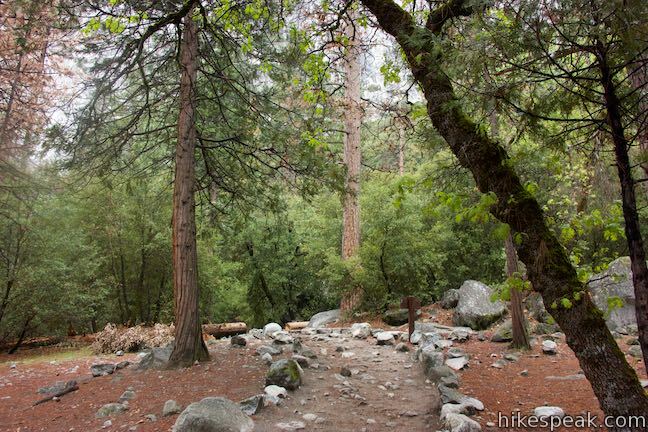 Thirteen campgrounds with over 1,600 total sites are spread throughout the park to facilitate your visit, including Camp 4. 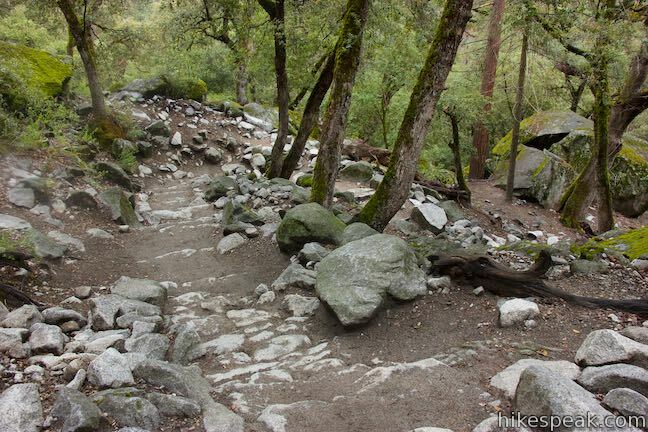 Name for person who creates steps from granite for trail construction?